Full-spectrum grow light Bulb, preferably a plant dedicated spectrum to meet the different requirements of the plants, directional light, high quantum flux densities suitable for no natural light environments such as Indoor Succulent plant cultivation, potted cultivation. Ideal for astigmatism light environment balconies fill light, flowers, plants, roots, root crops, fleshy ornamental plants, vegetables, leafy vegetables, fruit vegetables. PPFD(Photosynthetic Photon Flux Density)：the PPFD plants completely irrelevant to Lux and Lumen.PPFD is the important data of photosynthesis. According to PPFD to make out perfect light for plants.What plant needed is the light quantum in chlorophyll Effects of photosynthesis. Some manufacturers extend the spectrum to red +blue+ other wavelength. Its not real full spectrum. Not only higher CRI (color rendering index) of plant photosynthesis is better.The green wavelength is useless and wasted . But in some Ornamental plants high CRI can shows real color . Full Spectrum LED: Full spectrum LED grow lights have more of the type of light plants need. Constructed with 12 ultra bright LEDs. Rapidly boost the growth of plants. 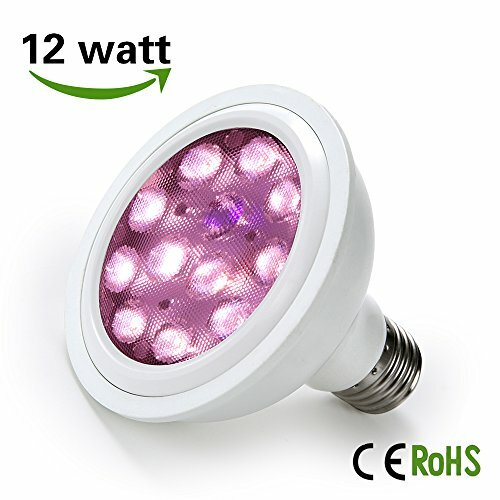 This grow light bulb is Perfect for indoor and greenhouse plants, garden, herbs, vegetables, seedlings, hydroponics & Aquaponics grow systems, etc. Waterproof Design & Energy Conservation: IP65 rating, waterproof LED grow light.High efficiency and high PPFD in same power.Use long life span elements,light operates easily for 24+ hours without overheating,overall service life is up to 25,000 hours. Soft and comfortable lights:White LEDs provide a balanced broad-spectrum of cool & warm mixed color.Natural Light is Ideal. No Harmful, Flicker free, protect your eyes.A much closer match to the spectrum of natural light than those emitting light at a few wavelength, more beneficial to the healthy growing of indoor plants. Easy to use: Fits standard base E27 socket; easy set-up with any desk lamp; no special lamp-base necessary. Favorable for various plants and different growth stage. Wide Application: 3-band targeted spectrum of particle wavelength (460, 630, 660 nm) emit the wavelength of light which can be fully absorbed by the plants photosynthesis. If you have any questions about this product by Dr. Easy Life, contact us by completing and submitting the form below. If you are looking for a specif part number, please include it with your message.